NBC Bay Area's Joe Rosato Jr. shows how a South Bay woman is helping preserve family history by painting murals. Every family has a member who ends-up with the boxes of old family photos. San Jose’s Margaret Ma is that person in her family. But unlike most keepers of hand-me-down nostalgia, Ma figured why let the family history just rot away in a dusty shoebox when there was a perfectly good stucco wall outside her home. So she hired an artist to turn the family photos into murals — for everyone to see. Homeowner Margaret Ma looks through a photo album of historic family photos. Ma decided to have some of her family’s photos painted as murals onto an exterior wall of her Palm Haven home in San Jose. In her Palm Haven neighborhood in San Jose’s Willow Glen, Ma hired artist Scott Willis to paint a series of murals on the exterior wall of her historic home — based on her family photos of the region. Artist Scott Willis paints murals based on the family photos of Margaret Ma at her home in San Jose’s Palm Haven Neighborhood. On one mural Willis painted Ma’s great-grandfather’s Keystone wholesale grocery business in San Jose from around 1908. In another, a hunting party of men and women pose in nearby Watsonville. 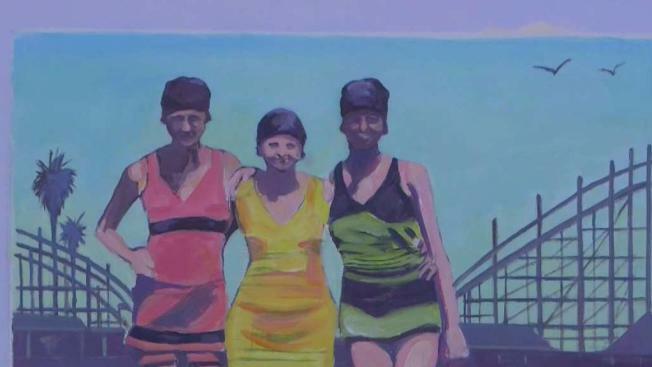 A colorful mural shows Ma’s grandmother and aunt standing in front of the Santa Cruz Beach Boardwalk donning 50s bathing suits. There is a painting of nearby Lincoln High School with Ma’s relatives standing out front. “Three generations of us went to it,” Ma said. A mural shows Ma’s family members standing in front of San Jose’s Lincoln High School. Three generations of Ma’s family attended the high school. Another mural shows the strawberry fields once ubiquitous in Watsonville. Ma said the picture is a nod to her great-great grandfather Robert Eaton who she said was the first strawberry grower in the area to ship strawberries by train. A jogger passes the mural-filled wall of Margaret Ma outside her house in San Jose’s Palm Haven neighborhood. Neighbors have closely followed Willis’ progress since the murals began to pop-up and take shape. They stop. They look. They occasionally weigh-in with their own artistic suggestions. On a recent day, Ruben Villalpando paused during a stroll to take-in Willis’ labors, suggesting the homeowner cut down the two small olive trees in front of the wall to not impede the view of the murals. Ruben Villalpando pauses to look at murals painted on a wall at Margaret Ma’s home in San Jose’s Palm Haven neighborhood. Ma and her brothers grew-up in the Palm Haven house her parents purchased in 1962. She and her husband eventually bought the home. It’s not hard to see how the neighborhood came by its name; its streets are lined with towering palm trees that make the neighborhood look as if it was plucked off a vintage Los Angeles post card and plunked down in San Jose. The traffic on nearby Bird Avenue is noisier than it used to be, Ma said. But she thinks neighbors are more close-knit. A mural outside Margaret Ma’s home in San Jose depicts the Keystone Grocery Company around 1908, which Ma’s great-grandfather owned. Willis put the finishing touches on a painting based on a favorite picture of Ma’s, showing her and her brother standing with a go-cart at the end of the street in front of the home decades earlier. Willis, who has painted other large outdoor murals in San Jose said he’s enjoyed working on the project — and appreciates that Ma is keeping a bit of family and area history alive — and visible.